One of the best ways you can save on your energy bills is to invest in a tankless water heater. Why? There’s no reason to keep a tank full of hot water sitting around at all times like with traditional systems. These machines heat water right at the source. We researched some of the best rated electric tankless water heaters to put together this information for you. First, let’s take a look at the key features to remember. Power: The power of these product varies a little bit. Some are specifically meant for heating water to the source while some can provide hot water for your whole house. The voltage of these machines ranges from 120 to 240. Kilowatts: A watt is a measure of power and a kilowatt is simply 1000 watts. The amount of power each of these machines has to actually heat up the water varies a lot, from 7.2 to 27 watts. Digital Display: A digital display is definitely not necessary for these machines to run effectively, but it is one way to make them a lot more convenient. Adjusting is effortless and you can make accurate readings from a further distance. 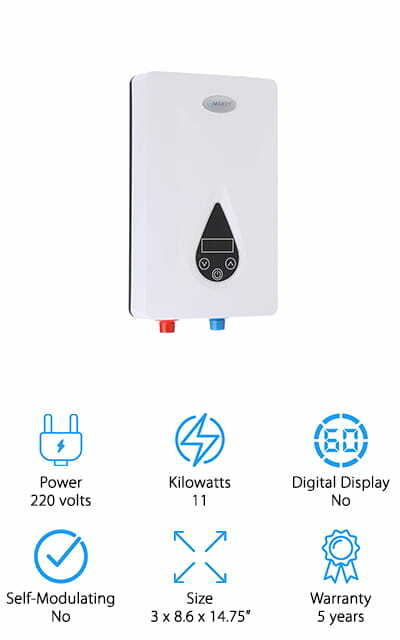 Self-Modulating: If a tankless water heater is self-modulating, all that means is that it as a sensor that helps monitor the energy needed to heat up the water. This is one way to make sure that machine is running as efficiently as possible. Size: You might be surprised to find out exactly how small some of these units are. Make sure you check the dimensions after you figure out where you’re going to install it just to be on the safe side. Warranty: These warranties sometimes have different terms for parts and leakage so if you see 2 different time periods for a product, that’s likely why. You’ll also find standard warranties from 1 year all the way to a lifetime membership. Not that you know a little more about what to look for, let’s take a look at the next part of our tankless water heater buying guide, the reviews. Here’s the deal, we put our top and budget picks right at the top of the list. This way, you can get a good idea of the range available even if you’re in a hurry. Stick around if you can, though, these products are all pretty awesome. Alright, let’s get going! 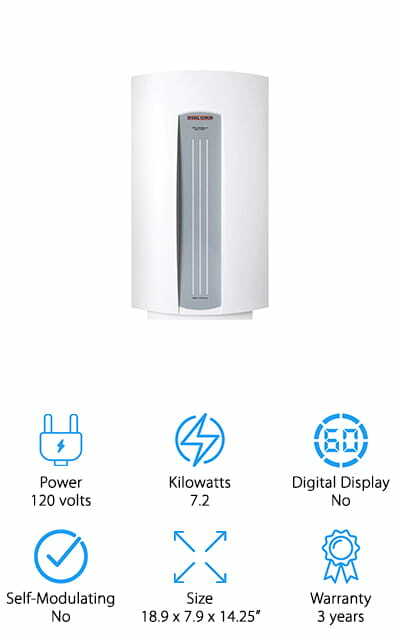 The best electric tankless hot water heater we found in our research is the Stiebel Eltron Tempra Plus. With this model, you can save up 20% of what it costs to heat your water. This unit has heavy-duty electronics, a single flow sensor, and an easy access hinged cover. Turning a simple dial allows you to change the water temperature quickly, easily, and whenever you feel like it. Because the compact, sleek design fits just about anywhere and doesn’t require venting, installation is easy. The advanced flow control feature is really great, too. To make sure you never run out of hot water, this product adjusts the hot water flow to maintain the temperature, even in high demand situations. The warranty covers 7 years leakage, 3 years parts. 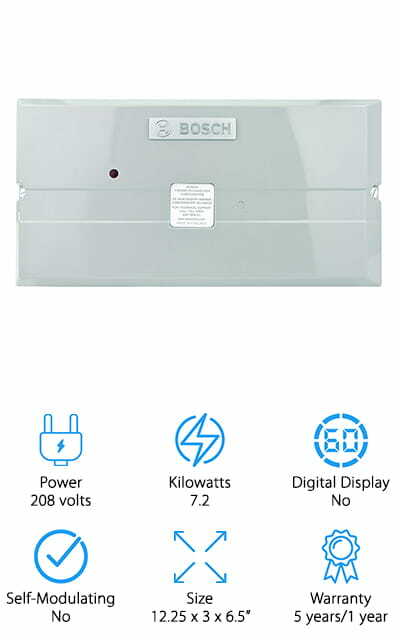 Our budget pick for electric tankless hot water heater is this system from Bosch. This water heater is meant to eliminate those long periods of waiting for hot water in your bathroom or kitchen by heating it right at the source. This isn’t a whole house model, it works right where you need it which is cool because if you only want something that works for your upstairs bathroom sink, you can do that without the cost of adding a heater meant for the whole house. Installation is simple, it fits right under your bathroom or kitchen sink. Mounting it to the wall is simple, too, because it’s ultra-lightweight, compact, and can face any direction. The simple design won’t draw a lot of attention and blends easily. 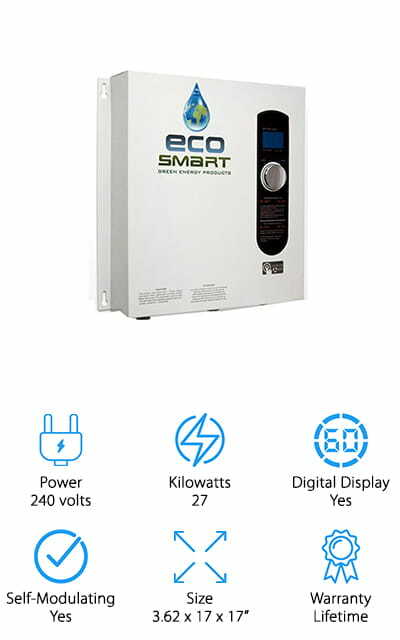 If you’re looking for the best whole house electric tankless water heater, this one from EcoSmart is one you have to check out. It has digital temperature control that allows you to set the temperature in 1-degree increments ranging from 80 to 140 degrees Fahrenheit. Its compact size makes it easy to install because it won’t take up too much space. All of the copper and stainless components are efficient and durable but also designed for easy replacement when the time comes. This product is capable of heating 3 gallons per minute of cool water that’s 37 degrees Fahrenheit. That’s like running 2 showers at the same time and never running out of hot water. This product can save you up to 50% of your water heating costs. Plus, it includes a lifetime guarantee. 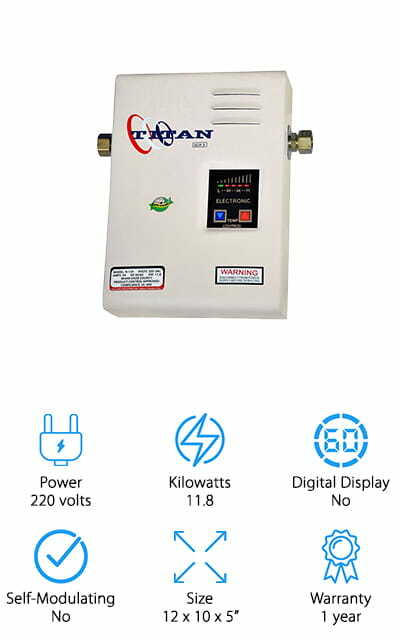 Next up is the Titan SCR2 N-120 Water Heater heats water when and where you need it. Depending on where you live and the size of your home, this can be a point-of-use heater or can be used to heat your whole home. It’s great for point-of-use heating in cooler climates. Generally, the warmer the climate is where you live, the less this and other heaters like it have to heat the water. Why? Because the water coming into the home is warm so the heater doesn’t have to work as hard to heat it as much. In places where groundwater is typically above 65 degrees Fahrenheit, this heater can be used to heat the water for a whole home and is effective enough to replace a large water tank system. The Stiebel Eltron DHC 3-1 Water Heater is next in our tankless water heater reviews. This item features a copper heating element and all copper design that’s durable and effective. Get this: it can even last for years without requiring any maintenance or service. The temperature is controlled with a scald guard feature that prevents it from getting too hot. It uses up to 50% less electricity than a standard water heater. Heating is maintained using a flow switch, manual reset, and a built-in thermostat. This product is compact and easy to install. There’s more, it’s hydraulically controlled so it runs really quietly. Plus, it’s small, doesn’t take up a lot of space, and is really easy to install. One more thing, it comes with a 3-year warranty. Here’s our next pick in our best whole house electric tankless water heater reviews, this model from Atmor. 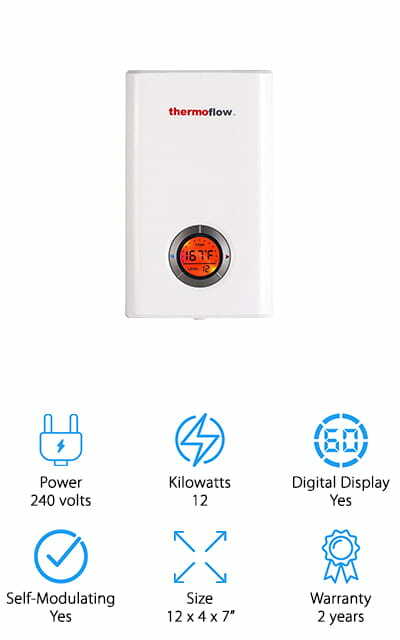 It features an easy to use digital temperature control display that lets you adjust the temperature in increments as low as 1 degree from 90 to 135 degrees Fahrenheit. This is an effective choice that can heat water at 37 degrees Fahrenheit at 2.2 gallons per minute which means it’s perfect for Northern climates where the groundwater is a little bit colder. It’s made of stainless steel which is durable and corrosion resistant which allows for a long life as well as effective heating. Installation is pretty simple because it’s a really compact unit that doesn’t require any venting. The warranty covers parts for 2 years and leaks for 7. 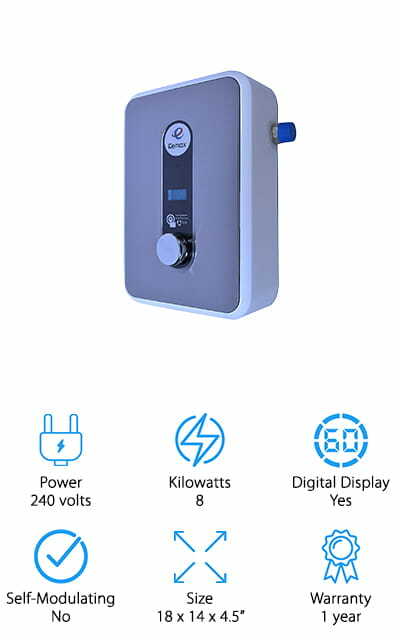 Here we have the Marey Tankless Water Heater, ideal for heating water for 2 points-of-use in southern regions where the groundwater is usually 70 degrees Fahrenheit or more. In colder areas, it can be used on sinks that produce 1.3 gallons of water per minute. The stainless steel water channel and heating chamber are tough and built to last. They even prevent rust and corrosion from being an issue. A simple LCD panel allows you to program and adjust the water temperature with only the push of a few buttons. No more letting the water run while you wait for hot water to come out. In all, this item can use up to 60% less energy as a standard tank heating system. It’s compact, simple design is easy to install just about anywhere. 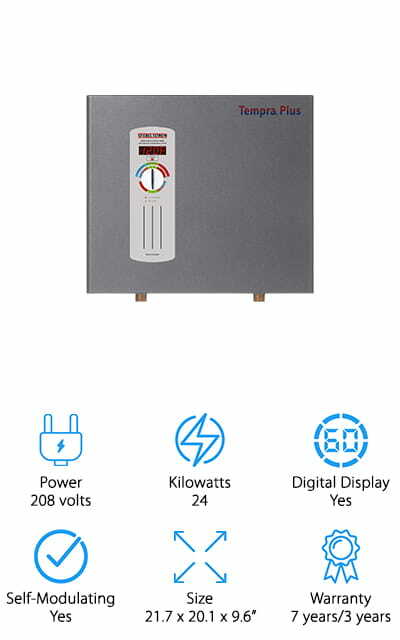 Our next choice for the best electric tankless water heater is the Eemax Tankless Water Heater. It has a durable copper heat exchanger that’s easily replaced with the time comes. A digital temperature display makes it easy to read and make adjustments as needed. Because this heater is so small and compact, you can put it just about anywhere. This heater incorporates scald prevention technology that maintains the water temperature at a constant temperature so you don’t have to worry about spikes or the water quickly getting too hot. You can adjust the set temperature by as little as 1 degree by turning the easy-to-use dial. That’s not all, because this unit runs on electricity, carbon monoxide is not a concern so it doesn’t require any venting. Last up is the Thermoflow Elex Water Heater. This durable water heater uses a high quality allow heating element that is corrosion and acid resistant which results in a longer lifespan. As for temperature control, a backlit LCD display allows you to make 1 degree adjustments between 32 and 140 degrees Fahrenheit. The compact, sleek design can be installed just about anywhere. It’s pretty inconspicuous, too, so it won’t stand out like a sore thumb no matter where you hang it. Compared to typical water heating systems, this model can save you as much as 85% on your water heating costs, depending on where you live and how much hot water you use. You don’t have to let the water run for a minute to heat up anymore. Now, get hot water right at the source. 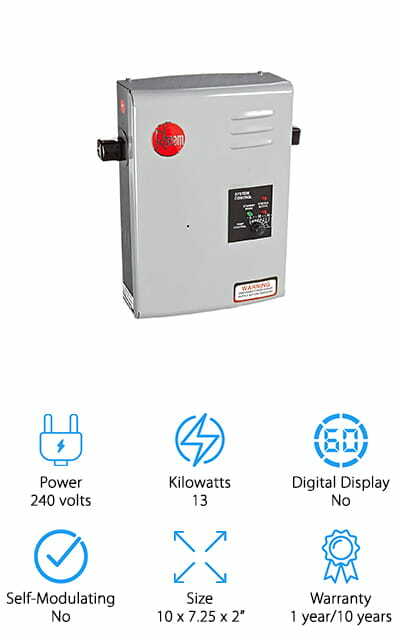 The Rheem RTE Tankless Water Heater is an indoor and outdoor electric tankless water heater that works with a standard ½” water connection. It features on-unit temperature control and uses an LED indicator light to display whether it’s in active or standby mode. This is a great option if you’re looking for a point-of-use heater. If you find the sink and shower in the upstairs bathroom never really gets warm enough or if you want to heat your outdoor shower, this is a great choice. 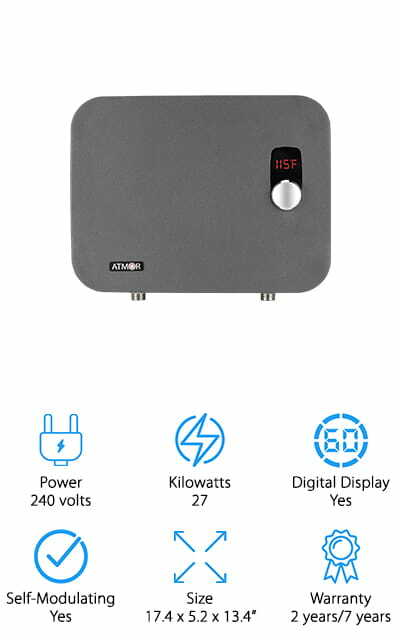 That said, if you have a small home, cabin, or apartment or live in a larger house alone and don’t use much hot water, users have reported a lot of success when using this model for a whole house heater.